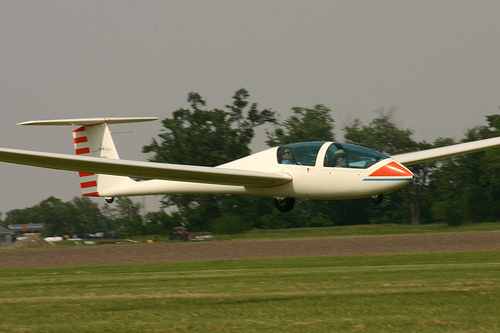 The Kansas Soaring Association (KSA) group has coordinated members from the Wichita area to the Colorado border. KSA is associated (and the state chapter) with the national organization (the Soaring Society of America - SSA), thus members of KSA are also members of SSA and receive a copy of Soaring magazine each month. KSA also owns a Cessna 182 towplane that is kept at the Sunflower Aerodrome just to the west of Yoder, Kansas. While most of the activity of this club is at Sunflower, it has also helped with events Ulysses in recent years. This is a volunteer club with members helping with the upkeep at Sunflower and also serving as either a tow pilot or a launch-line manager on a few occasions during the spring and summer. KSA operates a towplane, which is based at Sunflower Gliderport near Yoder, KS. Also, KSA rents a high performance two-place Grob G103 sailplane available to club members who are licensed glider pilots (3 hour checkout required). Monthly meetings are held, usually in Wichita at the WSU campus. KSA membership fees are $50.00 per year, if you are already an SSA member. If you are not already a SSA member, the fee per year is $100.00, which includes $28.00 for KSA yearly membership and $72.00 for SSA yearly membership. When you join KSA you are permitted to receive tows from the KSA towplane at no additional charge. All you will have to pay for are the air tows that you use ($20.00 for a 2,000 foot tow for KSA members). Visitors will need to join KSA to receive tows. KSA owns a Cessna 182 towplane that is kept at the Sunflower Aerodrome just to the west of Yoder, Kansas. We have the world's oldest C-182. Don't let anyone tell you they have it, because they don't. We do. Ours came down the line as a C-180 and got made into the prototype by Cessna by adding the nose gear. We got it at the end of 1961 and it has been serving us very well ever since. And, yes, it has a Standard AW, not Experimental or restricted or anything else like that.